Last week at this time we were collectively stress eating – and cooking – me doing my best to distract myself in the kitchen, simultaneously trying to come up with something munchy-snacky-comforting we could eat on the couch in front of the TV, when this passed through my Instagram field of vision. 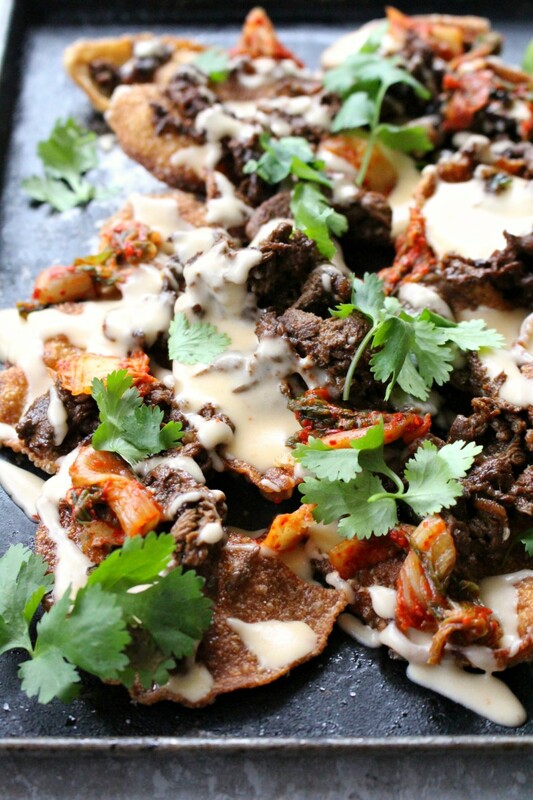 A pile of nacho-style fried wontons topped with salty-sweet bulgogi beef, kimchi and cheese sauce. Brilliance? I think so. First of all: the crispy wontons, which are simply wonton wrappers, halved and fried in a shallow skiff of oil in a small skillet (you don’t need much – and they cook up in less than a minute) which transforms them into a delicious cross between cracker and chip. I am so keeping this technique in my back pocket for those nights when we need some salt and crunch with structural integrity – they would do well with a hefty, cheesy baked artichoke dip. Mental note. 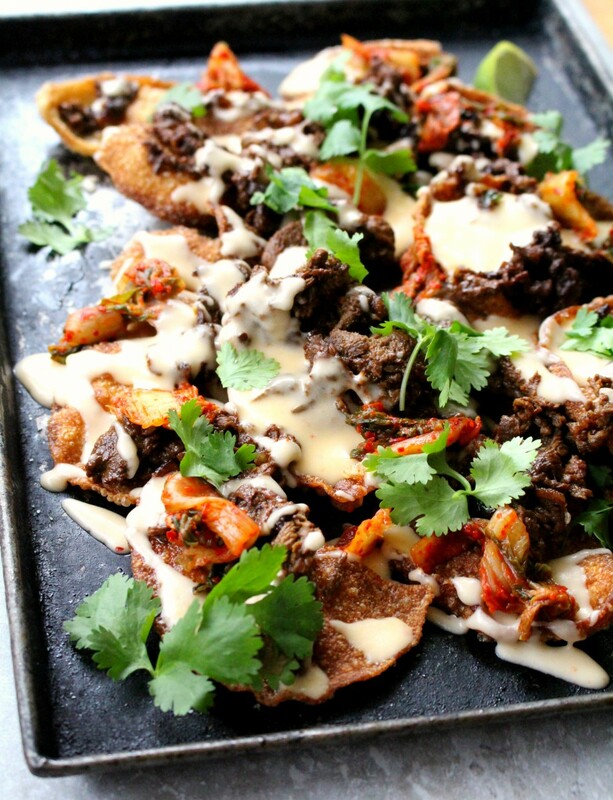 In this scenario, they’re topped with bulgogi beef – paper-thin slices of beef (I pick up mine at Arirang on 10th Ave SW – it’s difficult to cut that thin yourself) marinated in garlic, ginger, soy sauce and brown sugar, and often a diced Asian pear, but I li. 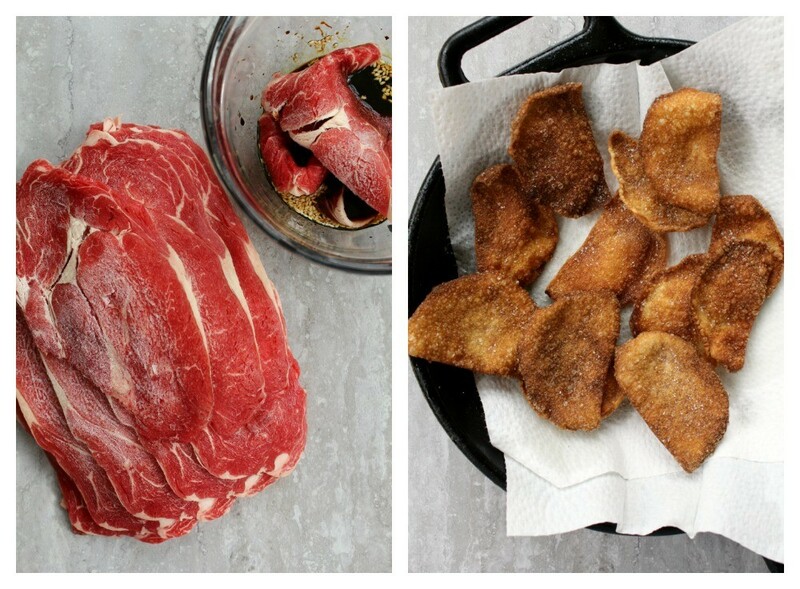 Bulgogi beef is delicious as-is, and cooks up in a couple minutes in a hot skillet – to use fried wontons as a vehicle is just the best idea ever. As is adding chopped kimchi, and making a cheese sauce with a splash of the fermented kimchi brine. You don’t need to bake them – just assemble the layers and bring them to the coffee table. 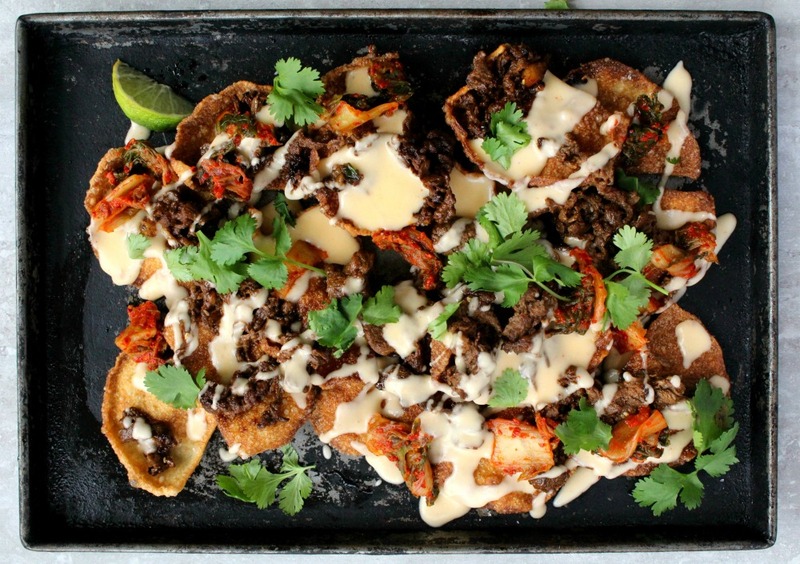 This combo came from the brilliant minds at Serious Eats (seriouseats.com) – they also like to cook the kimchi in a hot skillet, which tames it somewhat, and drizzle the finished nachos with lime-spiked sour cream. If you’re so inclined. 1To make the beef, toss it with all the marinade ingredients in a bowl or heavy duty zip-lock bag, coating the meat well. Refrigerate for a couple hours, or overnight. 2To make the cheese sauce, whisk together the butter and flour in a medium saucepan over medium-high heat; whisk in the milk and bring to a simmer, stirring as it thickens. Stir in the cheese and kimchi juice, stirring until melted and smooth. 3To cook the wontons, heat an inch or two of oil in a small, shallow pot or skillet until it’s hot but not smoking; cook about 4 pieces of the wonton at a time - or enough so that they aren’t overlapping - until they’re golden on both sides, turning with tongs. (This should only take a minute.) Transfer to a plate lined with paper towels and shower with salt while they’re still warm. 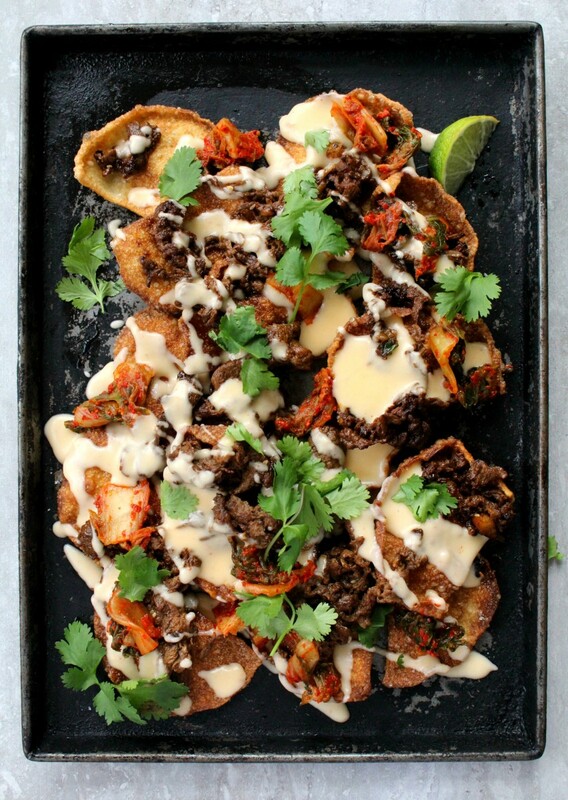 5Top the wonton chips with bulgogi beef, cheese sauce, chopped kimchi and fresh cilantro; add a squirt of gochujang if you like, and serve with lime wedges. Serves 4-6. LOVE Bulgogi beef! The more ways to eat it the better!